Dreaming of getting away this Winter? Thanks to Mick George and Premier Travel you can make this dream a reality. 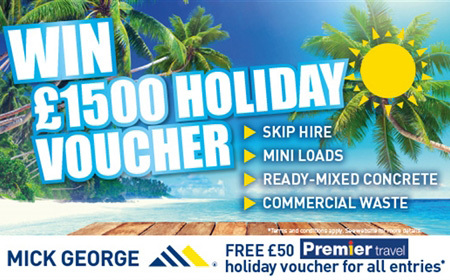 Whether you fancy taking the family to see Father Christmas in Lapland, skiing in France, or relaxing on a Beach in the Indian Ocean, one lucky Mick George customer will win a £1500 Premier Travel holiday voucher*. To be in with a chance of winning, all you have to do is place an order with Mick George for Concrete, Skip Hire, Mini Loads or sign up to their new Commercial Waste Service between the 12th October and 12th December 2015.